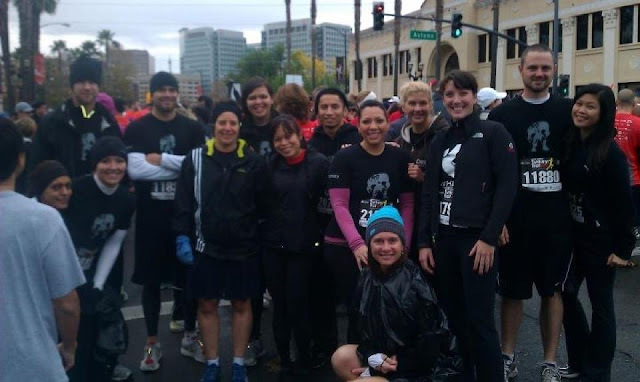 Representing CrossFit NorCal at Silicon Valley Turkey Trot! This year I got to spend Thanksgiving with the CrossFit ohana and Eugene's family. In the morning, I went down to San Jose to participate in the annual 5k/10k Turkey Trot with a bunch of members from the gym. Afterwards, I went home to prepare a traditional, gluten-free (hehe), Thanksgiving dinner. My family does not celebrate Thanksgiving so it was nice to learn how to prepare a Thanksgiving dinner from scratch! What better way to start Thanksgiving morning than with a workout? 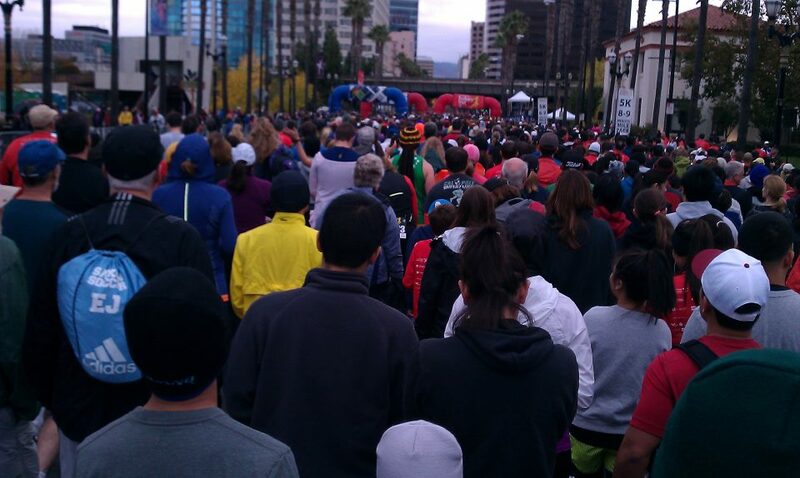 I signed up for the 5k run at the SV Turkey Trot. It was my first time participating in a race and my second time running a 5k, lol. Had I known more people from the box signed up for the 10k, I would have man-ed up a bit and tried that. Next year! 2. 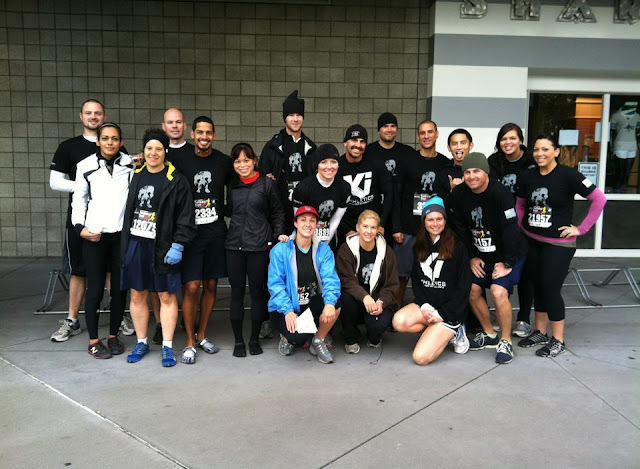 5k participants from the gym! Over 22,000 people participated this year! Apparently they sold out? Also good thing it did not rain. I was so worried about my feet getting soaked from those Vibrams, haha. 3. 5k-ers ready to start the race! Unfortunately, I did not PR my 5k time. I finished in 25:11, over a minute more than my 5k PR. However somehow, that was good enough for 16th place in my age and gender group. After the run, I raced home to start cooking. Good thing I did some prep work the night before! 4. Cooking, sampling, and football. The food! Appetizers: cheese (brie, goat, cheddar) and crackers, variety of grapes and apples, bacon wrapped dates stuffed with goat cheese. This was the first weekend I had cheese and crackers in probably, a year. Lol, I don't remember them tasting that good. Dinner: roasted rosemary turkey, garlic mashed potatoes, Jes' Thanksgiving sausage stuffing, stuffing with cranberries, roasted sweet potatoes, green beans, carrots, gravy, ham, and dinner rolls. Everything at the dinner table was gluten-free. I was so happy the turkey came out delicious.. super moist, since it was the first time I roasted a turkey! Brining the turkey beforehand was key for sure. To drink, I had fresh apple cider from the farmer's market and wine, from my favorite winery in Napa: Del Dotto Vineyards. For dessert, we had gluten-free and wheat-free apple pie and pumpkin pie. I also had just gluten-free pumpkin pie and lots of ice cream. I got most of the gluten-free baked goods from Zest Bakery in San Carlos. 6. Snacks and appetizers: bacon wrapped dates stuffed with goat cheese, fruit plate, cheese and crackers. 7. Cab from my favorite winery in Napa. 8. Dinner: green beans, carrots, garlic mashed potatoes, roasted sweet potatoes, gluten-free stuffing, Jes' Paleo Stuffing, herb roasted turkey breast (no worries, bone in), ham, gluten-free dinner rolls, gravy, butter from grass-fed cows. 9. Gluten-free and wheat-free apple pie and pumpkin pie, ice cream, whipped cream. Everything was delicious! I ate non-Paleo style for the past 5 days and definitely over-ate. It's going to be hard to get back on track!